"If religion can no longer dictate the nature of factual conclusions properly under the magisterium of science, then scientists cannot claim higher insight into moral truth from any superior knowledge of the world's empirical constitution. This mutual humility has important practical consequences in a world of such diverse passions..." —Paleontologist Stephen Jay Gould on "Nonoverlapping Magesteria," available online here. Inside Kentucky's Young Earth Creationism "Museums"
Figure 1a. A raging wildfire consumes the forest next to Highway 63 twenty four kilometers south of Fort McMurray Saturday, May 7, 2016. ONLINE EXTRA: Perspective: A selection from "The Teacher-Friendly Guide to Climate Change"
Ideas, discussion points, and activities to help students discover for themselves that viewing the world through naturalistic glasses can be useful, even if they don't think that's the only useful perspective. Evolution is a fundamental theory of modern geosciences and life sciences, yet it is one of the most controversial issues within science education. The origins of the controversy have both historical and philosophical roots. In this teaching activity, students examine dominant and alternative perspectives on what science is, what religion is, and the existence and location of boundaries between these disciplines. In this paper assignment, developed by Katherine Bulinski of Bellarmine University, students critically evaluate one aspect of the Evolution vs. Creationism debate. 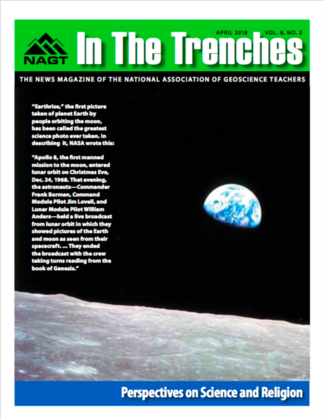 In this teaching activity, part of the collection of InTeGrate Teaching Materials, students learn about the nature of scientific knowledge. Before class, students read a popular science account of a 'controversy' in climate science. In class, the instructor describes the process of peer-review and scientific debate, and leads a conversation about how this is similar to and different from other kinds of knowledge. This may lead into further discussion of climate impacts and climate projections, but that is not included here. Students had an option to write their final paper about climate change and scientific knowledge. HSU's INRSEP & Diversity in STEM Program is a recently restructured program that will provide academic and research support services to historically underrepresented students in the Sciences. Started in 1965, the NAGT-USGS Cooperative Summer Field Training Program is the longest continuously running internship program in the earth sciences. Over the past fifty years, more than 2,300 students have participated in this program with an impressive number of these individuals becoming full-time employees of the USGS. The deadline for nominations is October 16, 2018.